A wellness is a complex installation consisting of multiple components of which the swimming pool, possibly with fountains and jetstream pumps, is the most striking one. Other components can be a hot tub, a steam bath, a sauna, a solarium, etc... All of these components use technologie that is developed and produced by different manufacturors. Some build exellent pumps, others have the best water valves. The heating units, sensors, pumps and valves that are part of such installations all have their technical specifications and requirements. It is clear that building a control unit for such a complex installation, in a way, so that it can be maintained swiftly and efficiently, is quite a challenge. The belgian company SwimControl, expert in bespoke wellnesses, came to us to help them develop a series of modules that would allow them to use any number of any kind of pumps, valves, heating units or sensors and integrate all of them into one single control. 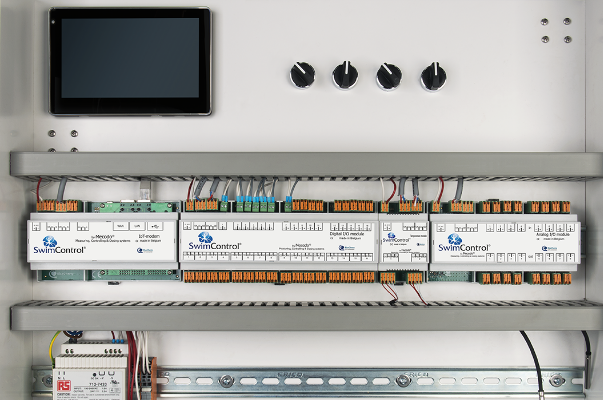 The MeCoDo poolcontrol consists out of 4 different modules which can control any combination of wellness components. For every wellness, the company can now choose the most efficient and best solution without making any compromise. Whatever the customer desires can now be realised in the best possible way. In- tegration with the home automation system, lighting and home access contol system are no problem at all. Swimcontoll now also offers remote monitorring of wellness installations, a complete new service they we not able to provide in the past. The BlueCherry IoT connectivity of the MeCoDo poolcontrol allows swift maintenance. The poolcontrol sends out notifications, alarms and data logs that allow SwimControl to solve upcomming problems before they actu- ally occur. The owner can turn on the heating from wherever he is and is automatically notified of interventions. Mecodo also offers pre configurated wellness controls to third partie installers. All that needs to be provided is a list of the components that will be used to build the wellness and they put together the perfect control.